English for the Turkish speaking community and all! Great for teachers and students. Teaching lesson plans suitable for a wide range of abilities are freely available for download. Student lessons have some translations available. Also Fırat is now here in English!! A new site is providing free English lessons for both teachers and students. A work in progress obviously but with some potential for those in the ESL/EFL world. 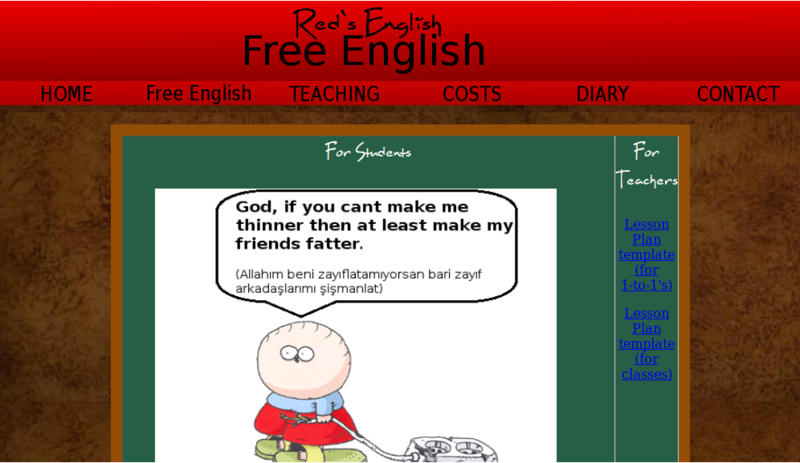 Go to Red’s English then click ‘Free English’. The site is updated daily so don’t forget to go back and check for the latest offerings. It’s not specifically for Turkish learners but there are some Turkish translations available. Lessons could be adapted for a range of nationalities, learner abilities and classroom sizes. Plus it could make a nice additional resource when looking for lesson ideas.